When people talk about Penang, food always seems to be at the top of the agenda. After all, Penang is almost synonymous with having the best street food in the world. Next on the list is maybe the many and unique street art that can be found around the Core Heritage Zone of George Town. And of course, the historic temples, mosques and churches that can be simultaneously covered whilst on a hunt for all the street art. Penang Hill and the funicular ride might appear in the list of things to do too, apart from maybe the beach and the night market in Batu Ferringhi. But then, what else is there to do and visit? Here are 5 places in Penang, old and new, which you might want to skip but probably shouldn’t. Two of them are located in the Core Heritage Zone itself, 1 in the city of George Town, and the other 2 in Teluk Bahang. The first camera museum in South East Asia, this is a must stop if you have the slightest interest in cameras and photography. It has well over 300 vintage cameras in its collection, all displayed according to their era right from the 18th century up until to the present day. In the Spy Room, there are also really some cool cameras like a Japanese Machine Gun Camera and some camera models which have been used by James Bond, spies and secret agents the world over. Walking along the corridors of the museum is like a walk through time too. No space is wasted. You can learn about the history of camera and find out about popular photos of all times too, all “written” on the wall. The dark room and the pinhole camera room show how cameras and photo printing work, at least in the old days. The Obscura Room lets you learn the concept of photography. Afraid of feeling lost in the sea of cameras? There’s a guided tour that is available at the museum every hour, which lasts for about 30 to 40 minutes each time. Once you’re done with the tour, you can always retrace your steps to take more photos, which, of course, is more than encouraged by the museum management. You’d probably need to allocate at least 1 hour here, unless if you’d like to hang out in the Double Exposure Café at the back of the museum at the end of your visit. The ground floor of the museum is free to enter, by the way, and from time to time, there are some photo exhibitions there too. All the cameras and other exhibition rooms are located on the 1st floor, however. "Little Girl in Blue" street art is located just around the corner of the building. How would you pose in this photo? When I found out that I was going to Made in Penang Interactive Museum as part of #MyFascinatingPenang programme in August 2015, I thought to myself, “Oh no! Not another 3D museum!” I mean, I’ve been to a few such places before and there’s not much difference in terms of what is on offer. Most of these places offer creative 3D artworks where you can stand or sit (or you can come up with your own pose/style) at a designated place to create your own “masterpiece” on a photo. These places seem to be mushrooming in many destinations and seem to be popular as well, especially among youngsters. In Penang alone, there are probably at least 3 such places that I noticed while walking around the town. That is on top of all the street art which you can find freely around the town! So what else is new? 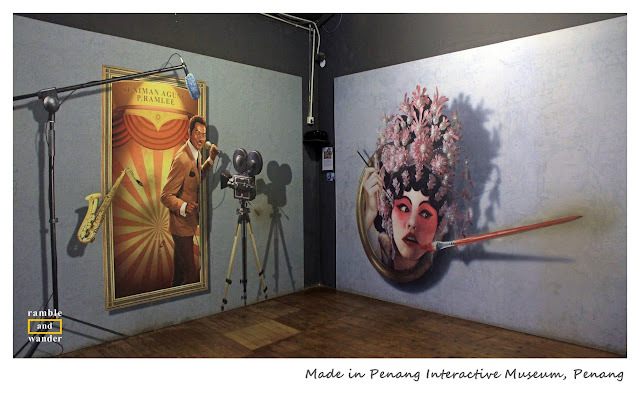 What differentiates Made in Penang Interactive Museum then? The answer, which I found out after visiting it, is plenty. There is a reason for “Made in Penang” in the name of this interactive museum. It is simply because everything that is shown and shared here is all about Penang, and this, makes all the difference. When visitors enter the interactive museum, we’d first enter a section where there are a few dioramas on display, narrating the story and history of Penang. There are dioramas about the locals – Malays, Chinese and Indians – and their cultures, such as food and traditional games. These, no doubt could help give a brief and quick insight about Penang of the old, if one cares enough to spend some time to read the narrative that comes with each diorama. There is also a bigger diorama (handmade & of about 20-feet long!) depicting scenes of the old Pengkalan Quay (Penang jetty waterfront), with sampans carrying goods and spices, with trishaws waiting for customers, and with even a nasi kandar seller entertaining hungry folks. Incidentally, the building in the diorama is also the building in which where Made in Penang Interactive Museum is located at. Pretty neat, I’d say. Going upstairs, you’d find plenty of 3D interactive trick arts to take photos with. The unique thing about these 3D arts, as previously mentioned, is that they are all related to Penang. For example, scenes from some places of interests in Penang (like Penang Hill, Penang Ferry, Queen Victoria Clock Tower), famous Penang personalities (like the late P. Ramlee, the all-rounder director, actor, singer and an icon in the entertainment industry from the 60s and early 70s; and even the current state’s chief minister - although this is located outside near the entrance), and Penang cultures and even delicacies like prawn noodles. And how would you pose in this photo? Overall, I think this is a good place to visit with the family and/or friends whilst in Penang, especially if you’re into 3D interactive trick arts, and love posing for photos with some sense of humour. Even if you’re visiting alone, fret not, there are plenty of staff around at hand to help you with taking your photos. The plus point is that you get to learn a bit about Penang while still having fun here. And the best thing about taking photos with these 3D arts at Made in Penang Interactive Museum? It means that you’re not just taking photos of 3D arts like at any other place, but you’re capturing and bringing a piece of Penang back with you. If you want to spend some time to escape the crowd and the bustling city of George Town but do not want to go all the way to Batu Ferringhi or Balik Pulau, Penang Botanic Gardens could be your answer. With twelve different types of gardens, e.g. Lily Pond, Fern House, Cactus House, Orchidarium, and a few others, Penang Botanic Gardens is an interesting garden to walk around, especially as it has an easy walkabout layout, making it suitable for everyone. Even the Tropical Rainforest Jungle Trek at the gardens has a paved track. :) If you don’t feel like walking but still would like to see the gardens, there’s a tram service which you can take at the entrance to the garden, although the service doesn’t cover the whole garden, so you might lose out a bit. Apart from the flora and fauna that one would usually associate with any botanic gardens, watching monkeys frolicking around could also be the highlight of the trip. Just make sure you keep all your belongings (and food) close to you. All things considered, it’s a good place to reconnect with nature, without having to go far out of George Town. Tropical Spice Garden was a place that, admittedly, I had never heard of before I found out that I was going to Penang for the #MyFascinatingPenang programme. Checking out its website and some photos online made me wonder why I had never heard of it before, especially as it has been in existence for well over 10 years already. I guess maybe because it’s a pretty niche destination and would only appeal to some groups while not exactly be attractive to others. In any case, Tropical Spice Garden is an award-winning eco-tourism destination in Penang. Built on an abandoned rubber plantation land, the garden showcases over 500 varieties of fauna and flora – with an emphasis on spices, and thus the name – spread over 8 acres of secondary jungle. This is the place where you can learn about nature and the importance of plants. Whether you opt for just the audio tour (included in the price of the basic ticket) or opt for the live guided tour (ticket costs extra), you’re sure to learn more about this garden’s speciality, tropical spices and herbs. That is provided if you care enough to listen, of course, heh! ;) My advice: if you’re serious about learning more, then do opt for the guided tour. That way, you’d have a more interactive walk around the area and can ask questions directly if you’re not sure about something. However, if you just want to take a stroll and explore the area in a jungle-like environment, an audio guide tour is probably more than enough. For the more “adventurous”, there is also a cooking school on the ground, where you can learn hands-on how to cook a variety of cuisines like classical Nyonya, Malay’s nasi lemak, and even Northern India’s chicken curry and tandoori. There is, however, a separate fee for this. You can find out more about the school, including the cooking class schedule, at Tropical Spice Garden Cooking School website. For the less adventurous among us, the Gift Shop is a great place for picking up some great quality spices, whether as souvenirs or for our own use. If you use Hop-On Hop-Off Penang ticket, the bus stops right outside the entrance to Tropical Spice Garden on the Beach route. This is the place to be if you’re looking for adventure and some adrenaline rush, in a healthy way and in a safe environment. Escape is essentially a theme park but a different one as it departs from the usual ideas of roller coaster rides and the likes. Instead, it goes back to the past and draws on childhood games and traditional values that encourage creativity, physical wellness and connection with nature – whether running around outdoors or even climbing up trees. Something fun yet can be challenging. Escape.my’s idea is low tech and high fun; and it allows everyone – kids, youths, adults, and even elderly – to have fun all day long as their rides and games are designed for all age groups with different abilities and energy levels. Set in a hilly forest landscape, you can try out many interesting activities that would make any outdoor enthusiast happy. Among others, they have “rock” climbing (Gecko Tower), flying fox or ziplining (Flying Lemur), treetop walking (Monkey Business) obstacle courses, tube slider (Tubby Racers), controlled jump (Atan’s Tower), and even flying trapeze (Aerobat). Overall, I think Escape.my is not just for outdoor enthusiasts, it’s an all-around activity place for friends and everyone in the family. The place where kids can be kids; the youngsters to get away from all the tech gadgets and reconnect with nature; and the adults to catch up with their childhood. You’d probably need to allocate at least ½ a day here to enjoy all the activities on offer. No outside food/drink is allowed – the guard would check your bag and take them out for keeping if you have them. So do have something first before you go in. Food and drinks, however, if required, can be bought on-site, although the selection might not be that extensive. Use sunblock and maybe insect repellent too. Go on a weekday, if possible. If you’re taking RapidPenang bus to the place, you can claim your fare at the ticket counter. There’s a free shuttle bus from the place in late afternoon, so your trip to and from Escape.my can be for free. If you use Hop-On Hop-Off Penang ticket, the bus stops right outside Escape.My on the Beach route. Yes, buy the Pass. It costs just RM20 (price update 2018) but gives you up to 20% discount at over 100 outlets. It's a no-brainer, real value for money! It can be used in some popular places, including The Camera Museum above. The Pass can be bought at Penang Tourist Centre in George Town. For more info, check the official website. I used Hop-On Hop-Off (HOHO) Penang buses to get around whilst in Penang and all the above 5 places either have their own designated HOHO bus stop or is close enough to one to walk to. You can read about my experience, and find out about the advantages, of using HOHO Penang here. If you're planning a trip to Penang (or anywhere else in Malaysia, for that matter) by public transport, you can buy your bus or train ticket online through easybook .com without much hassle. It's really as easy as the name says. Each one of them is highly recommended and has their own strengths and appeals so do go through all of them before you decide. I would like to thank the organiser of My Fascinating Penang, My Amazing Malaysia, for the opportunity to be part of My Fascinating Penang 2015 programme. Typical kan? Susah sebenarnya nak jadi hometown tourist dan tengok/melawat tempat2 drp pandangan sbg org luar. Thanks, Paula. If you guys are heading to the Camera Museum, don't forget to get the Museum Pass first for some savings! I love the sounds of the Tropical Spice Garden but I know that if my husband reads this post then the Escape My will be firmly on our list when we visit. Love your tip box format, really adds to the post. Tropical Spice Garden and Escape.My are quite close to each other actually, so you guys can easily either make a day trip to both or each visit a different place and agree to meet up at one later in the day. It has been many years since I visited Penang, but you are right we only went for the food and a bit of shopping! I wish I knew about Escape when we were there, looks great! Actually the Camera Museum would be my highlight in Penang! i love quirky museums, I'm a little bit interested in photography so it seems like a perfect place for me! And from your description it sounds really cool! I know anyone who's interested in photography would love the Camera Museum! The good thing about the place is that those in the group who prefer not to see the camera collection can just wait downstairs in the cafe or walk around the area as there are a few street art nearby too! Your welcome! Botanical Gardens & Tropical Spice Garden certainly are a good choice if you enjoy nature and love to be surrounded by it. They surely provide a respite from the hustle and bustle of the city. Thanks for this! Sounds like we may need at least a week to fully explore Penang! I especially love the idea of the cmaera museum, so that's definitely a not to miss - we're huge photography geeks, though I had no idea that this was the first museum in South East Asia! So it's definitely on the list. Thanks for this!! Now we won't be disappointed at having missed anything! Yes, the Camera Museum is quite small but it's definitely not to be missed for those who are into photography. The collection that they have is quite good actually, in my opinion. I'm not sure about the recommended length of stay in Penang as I guess it would depend on individuals. However, I was there for about 5 days last month and I thought it still wasn't enough. The camera museum sounds like exactly the sort of place that I love to visit! I thought you'd love the museum, Dave! I know so little about Penang so I found this post very informative and fascinating. I'd love to visit all of these places but being a photographer I think the museum of camera's appeals to me the most. I'd find it really interesting to read more about the evolution of cameras. The Camera Museum is definitely a not-to-missed place in Penang if you're a photographer. It's quite small but the collection and exhibits are quite good, in my opinion. You can even play around with some of the vintage cameras there. I quite love Escape but I think you have to go there with a friend or friends to have more fun there. Which similar place did you go to, by the way? Just stumbled on your website and this post. Love your work. Great website and great post! Totally agree with you on the top 5 not to be missed when visiting Penang. Informative and accurate. TSG is top of my list favourite. Entopia Penang which was just opened at Teluk Bahang, Penang has to be my all time favourite. World class butterfly farm! Educational and great family outing for the children.